To use the API on players with the responsive embed code, see our updated Player API documentation. 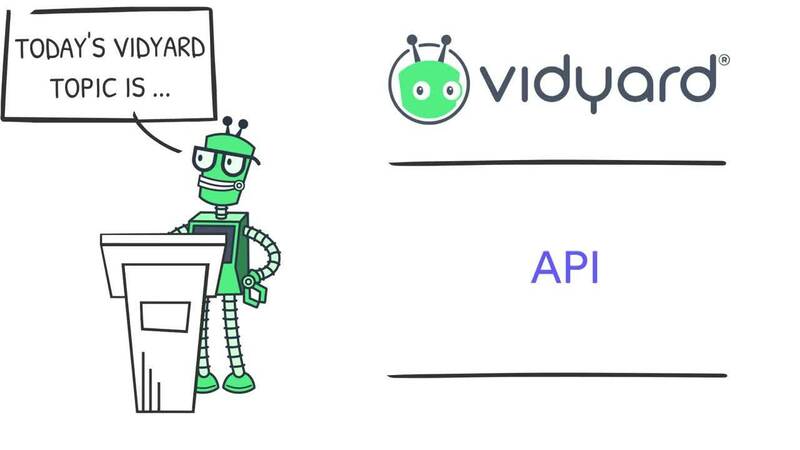 Use the Vidyard player API script with either the Use either the Legacy Inline or Legacy Lightbox Embed codes. Add the API script to the webpage where your player(s) is embedded. The last line of the script, <script src="//play.vidyard.com/v0/api.js"></script>, must follow the player embed code. Players are referenced via their UUID. The UUID can be extracted from the player embed code or sharing page URL. For example: http://embed.vidyard.com/share/oTDMPlUv--51Th455G5u7Q. The player UUID is oTDMPlUv--51Th455G5u7Q. .setVolume(volume) Set the player volume. The volume value is the desired player's volume represented between 0-1. .toggleFullscreen() Toggles player between fullscreen and original dimensions (whichever is the opposite of its current state). .playChapter(index) Play a designated video within the player. The index value is the desired video beginning at 0 for the first video. .getCurrentChapter() Returns the index of the current video within the player. .enableCaption(language/label) Enables captions. The language and label values allow you to specify which caption to enable. If a value is not specified then this method will enable the first caption. .disableCaption(language/label) Disables captions. The language and label values allow you to specify which captions to disable. If a value is not specified then this method will disable all captions that are showing. These methods were implemented in order to enable customers to achieve GDPR compliance on webpages where Vidyard players exist. The methods are used to communicate to players whether a visitor has consented to having identified view data passed to Vidyard. Note that Vidyard.GDPR.consent calls set to true persist in localStorage, so visitors to your webpage do not need to accept tracking on every page load. When players do not receive consent, only completely anonymized viewing data will be passed to Vidyard. Vidyard.GDPR.consent () Sets consent for every player on your page to true or false. This method assigns consent on a per subdomain basis. Vidyard.GDPR.hasConsentOnReady (callback) Callback receives true or false upon all player ready. This function is intended to determine whether or not to display a consent prompt upon page load. Use player.metadata to return information about the player (title, length, description, public custom attributes, etc). This data is available after the ready event has fired. null is returned otherwise. Use events to craft responses in reaction to a player's behavior. ready Fired when the player has loaded on the web page. play This event fires when the player (re)commences playback. Note: This function does not affect players when viewed on iOS devices. pause This event fires when the player is paused. beforeSeek This event fires immediately when the viewer seeks. This event fires when the viewer has completed a seek action to a new postion in the player. playerComplete This event fires when the end of the player is reached regardless of any seeking or pauses. chapterComplete This event fires when the end of a chapter is reached regardless of any seeking or pauses. timeupdate This event fires every ~100ms during playback. volumeChange This event fires when the volume is changed. See our documentation for additional player API examples.